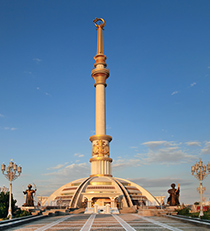 The surreal world of Turkmenistan is the least explored country on the Silk Road and most certainly the most bizarre! 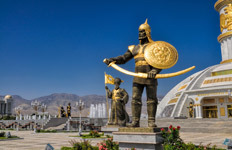 The former last frontier of the old Soviet Empire, a large majority of the country is covered by the large, empty and baking hot Karakum desert which for centuries has been Turkmenistan's best defensive weapon, successfully repelling outsiders, adventurers and armies. With a gold statue of him available on every pedestal, several towns named after him and enough public portraits to fill several National Portrait Galleries, President Niyazov - otherwise known as Turkmenbasi (Head of all Turkmen) - has a personality cult that makes Lenin look shy and this appears to remain unabated following his death in December 2006. 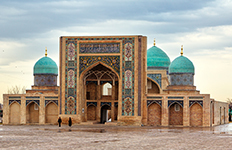 This 7 day trip will take you on a journey to the least visited of Central Asia's countries - Turkmenistan. Go off the beaten path and enjoy this ancient land of great spirituality, tradition and natural beauty.